Rock Climbing has become a passion of mine since I joined Mission Cliffs in San Francisco 4 years ago. Although I do not do any outdoor climbing, bouldering has become a primary source of exercise for me. When consistently hitting the wall I see immediate strength and body composition changes. As a Physical Therapist I have a unique perspective on the training effect and injuries occurring due to trauma and more importantly, overuse. Although many varieties of climbing exist (bouldering, soloing, sport climbing with belay, competition climbing, and alpine) we will be referring primarily to sport climbing (short belay) and bouldering because these styles are used indoors at gyms. Rock Climbing is becoming increasingly popular among not adrenaline type fitness seekers. It was known more as an extreme sport, but as more gyms are incorporating climbing walls the sport has grown to 9 million participants each year. With the surge in interest among non skilled climbers comes increased risk of injury. The most common injuries in rock climbing are caused by falls and include fractures, sprains, and strains that occur in the lower extremities. Ankle sprains make up the majority of acute injuries in climbers. Overuse injuries were reported at 44%, 19% at more than one site in a study published in the British Journal of Sports Medicine. I am more interested in overuse component because as a physical therapist I have seen an increasing number (or shoulder and knee injuries) in this population. Hand and wrist iuries are by far the most common overuse injuries, but is not my expertise so I will be focusing on shoulder and knee injuries I have seen in climbers. This sport requires power strength, endurance strength, flexibility, technique, patience, and TECHNIQUE. Those who lack technique or are untrained (poor core and shoulder stability or flexibility deficits) are at risk for overuse injury. 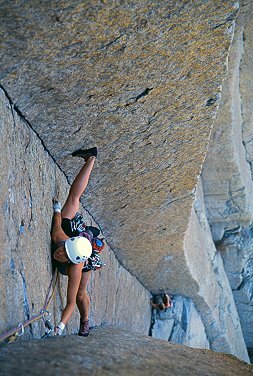 At the same time, many seasoned climbers are solely die-hard climbers. Just as any other sport, climbing requires cross training and balance maintenance through flexibility and strength training. Climbers develop shortened latissimus dorsi, increased kyphosis and “climbers neck (forward head posture)” which can lead to Upper Crossed Syndrome. Other injuries include elbow, wrist and hand tendonopathies, and Spinal Pain (which is beyond the scope in this blog). In addition to overuse, some of the skilled techniques used in climbing can also be problematic. 1) Edging – Refers to placing the leg in external rotation (frog leg position) with the majority of the load through the big toe. At same time incorporating a lift in the heel will provide additional foot stability for ascending and creating power more securely. If there is not enough hip mobility/ stability or calf/foot stability the knee can become the fulcrum point leading to sprains, strains or imbalances. 2) Stemming – Refers to using counterforce to support yourself between two spots. This requires flexibility at the hip and shoulder and joint stability to facilitate extremity stability on the wall when there is minimal holds available in a corner or between two rocks. Lack of either can lead to shoulder, hip, or knee injuries. 3) Manteling and downpressure – Refers to the downward pressure through your arms to create counter force or to match your feet to your hands to get higher. Both of these techniques require a downward pressure and depression of the scapula (serratus activation). Lack of shoulder or core stability or enough flexibility may lead to shoulder injuries. 1) Shoulder Impingement – This is probably the most common overuse injury I see in climbers and is also the most treatable and preventable. Once the rotator cuff or bicipital tendon become injured or painful, the best thing to do is “active rest.” As stated before, many avid climbers do not train their imbalances with cross training and will usually get away with it. With shoulder impingement, rest from climbing is imperative. In addition, get in the wight room to strengthen the rotator cuff and scapular stabilizers for improved balance around the shoulder. If posture is the problem, then get on the foam roller and do your corrective exercises to align the tissues around the glenohumeral and scapulothoracic joints (shoulder and shoulder blade). 2) Shoulder Labral damage – Unfortunately this injury is becoming more common and if too severe cannot be treated without surgery. There are several ways the labrum (the connective tissue surrounding the socket of the shoulder that provides stability) is injured depending on the location of the lesion. SLAP (Superior Labrum Anterior to Posterior), Bankart, or Hill Sachs Lesion involve different pathologies in the capsule of the shoulder. SLAP tears may occur from overuse of the bicep tendon (common with pulling movements) or from putting the shoulder in awkward reaching back positions used in stemming. Bankart and Hill Sachs lesions are usually seen in hypermobility or dislocations which may occur during manteling/down pressure or during falls. 3) “Lateral and posterior knee pain” – I have seen a myriad of injuries at the knee presenting as IT band Syndrome, hamstring tendonitis or ligamentous instability. Many of the patients believe the injuries are related to other activities (no trauma during climbing). However I believe the hip rotation movements seen with toe in and out holds eventually leads to microtrauma in any of the structures mentioned above. Many people do not know that there are actually three joints at the knee (Patellafemoral, Tibiofemoral and the overlooked proximal Tibiofibula joint). When technique gets sloppy or there are flexibility deficits at the hip, the proximal tib-fib joint may be repetitively strained and lead to instability. This combined with excessive calf work required for the heel up technique (mentioned above) leads to dysfunction, cysts, or joint changes. The same mechanism of injury can also lead to meniscus tears. 1. Warm up and Stretch: This may involve several minutes on the bike or dynamic sub maximal movements to heat the muscles. Many climbers will start with easy routes. Because these emphasize using the already dominant muscles it is not optimal for waking up the muscles that control balance in the joints. For warm up and stretching I recommend doing yoga (sun salutations) or lunge matrices with arm movements to loosen up the whole body. Here is a video of the Gary Gray common lunge matrix. 2. Work on your Imbalances: If your hamstrings or hips are tight, stretch them. If your lats or pecs are tight, stretch them. Again this can all be accomplished by doing regular yoga. Every climber should be doing preventative shoulder stability and core/hip stability exercises. This doesn’t mean doing more climbing to strengthen your body. It means finding the exercises that isolate the weaknesses (usually the rotator cuff, middle/lower traps and deep hip rotators). If you are not sure what your imbalances are, find a trainer or physical therapist. 3. Rest between climbs: I recommend climbing no more than every other day in order to prevent injury resulting from fatigue. It is best to do your imbalance correction exercises on the days you do not climb which will ultimately enhance your performance and prevent injury. 4. Off Season: Just as you should rest your body between work outs, you should take 1-3 months off every year for recovery. Every other sport requires an off season in order to allow the body to recover…so does climbing. This is all part of periodization and strength training professionals have this down to a science. It works not only for injury prevention, but will also enhance your performance in the long run. 5. Power Training: If you do not currently have an injury such as the one described above, power training may be necessary. For beginner or advanced climbers who are looking to advance their performance this may be the missing link in training. 6. Improve your technique – practice, practice and practice. Take beginner and intermediate courses. Work out with experienced climbers. This is by far the most important component of prevention. Unfortunately if prevention does not keep these common injuries from occurring, Rest and Rehab is a necessity. From Experience, overuse injuries can be frustrating with sports requiring the amount of power used in Rock Climbing. Many shoulder and knee injuries may ultimately require surgery if not treated conservatively early into the pathology. Thanks to one of my loyal patients encouraging me to climb, I was hooked. It is my hopes that the sport continues to grow safely. The benefits to recreational and fitness climbing are numerous if you train correctly. Check out the links below for more information on Rock Climbing injuries and fitness. Wow! GREAT article, thanks for putting this together. I’m not a climber, but this gives me more insight if I were to see one. So true- working on imbalances- some think just doing more of their sport is going to make them better. So important to cross train and work on specific weaknesses. Thanks for the comment Monique. Thanks for the very informative article. What is your take on Gyroscope balls (http://www.squidoo.com/PowerballGyroscope) to improve forearm strength to prevent injuries? Thanks for the comments. I think the Gyroscope balls are great. Very practical for developing strength in the entire upper extremity for overhead sports. Great for rhythmic stability for the shoulder. Do you suggest a certain model? I have not used one in my practice. I came across this article via a google search on chronic hip pain in relation to climbing. I’ve been climbing for over 9 years, entirely bouldering (V8/9), and find myself for the first time with a chronic (6+ months) hip problem. Shoulders, fingers, and ankles (ow >o<) seem to be the most common injuries we encounter, but this is a first. Aside from time taken off (2-3 months), x-rays, an orthopedic doctor and subsequent strengthening exercise regimen, chiro, and now acupunctur, I'm at a loss. In my early 30's, I'm fairly sure that years of stemming and drop-knees have put me into the position I find myself in, but haven't yet gotten any answer as to what exactly has happened, nor why it simply refuses to heal. Next up is an MRI, but I can't see how I would have anything new to add to my list of potential remedies. If I stop climbing, my hips gradually stop hurting. If I go back, even after months of rest, the pain returns almost instantaneously. I'm be really curious if you have any insight. Thanks again for all of the effort. I can see why you are frustrated. Often the knee takes the brunt of repetitive positions not optimal for the hip joint capsule. Luckily you have avoided a knee problem but I have a good hunch the MRI will show some labral damage. Typically joint capsule pain will be in front/groin area but can be Misdiagnosed as a hip flexor or groin strain. Regardless if you have labral damage and need it repaired, I would recommend modifying your techniques some. Avoid excessive crouched positions or traversing with affected hip across the pelvis. And definitely you need to be cross training. My comment, though more of a question, seems to have disappeared. regardless, thanks for the article. My name is James King and I’ve got a question about the “lateral and posterior knee pain” section you wrote in this posting. I found it very interesting. I would appreciate it if you could send me an email at jamesearlking@gmail.com. My girlfriend had a labral Tear in her shoulder a year and a half ago. Thankfully it healed without surgery with PT. Things were all well and good for many months until she began doing pullups with very bad, choppy form. Pains began to return to her shoulder and soon enough she was officially “injured” again.. The same ortho that confirmed labral tear previously tested her for it again and found that he larbrum was strong and doing good but diagnosed her with bicep tendonitis. The PT prescribed doesn’t seem to be helping her though and she feels that it is more than just bicep tendonitis. She feels pain at the bicep insertion at the Labrum and also the back of her arm. What could be going on? What can she do? I apologize for not responding earlier. When the MD tested her shoulder did he also do an MRI? I realize this was months ago but I wanted to make sure I followed up. It is hard to diagnose a labral tear correctly in the clinic. Also, they do not “heal.” It is likely that she was feeling better because the inflammation went down during the rest period.